BLUEPEACE blog » MALDIVES ALLOWS HARVESTING OF ENDANGERED TURTLES EGGS: Isn’t it the High Time Maldives Outlawed all Marine Turtle Egg Consumption. All marine turtles not all the eggs are protected in the Maldives and the most recent legislative measure to conserve turtles came into effect from January 2006, when for the first time harvesting turtle eggs from 14 islands was prohibited in the Maldives. In addition, the regulation prohibited catching or killing of any marine turtle species nationwide, and their sale, import and export of its products for ten years. Bluepeace from very its inception in 1989 has been adamantly advocating for the conservation of marine turtles in the Maldives. Prior to the Rio Summit in 1992, the Maldives was the second largest exporter of the tortoiseshell (hawksbill turtle shells) in the world, and Bluepeace felt the seriousness of the issue, and raised our concern with the President of the Maldives and requested to take measures to protect the endangered turtles in the Maldives. Few months later, the Government enforced a tortoiseshell export ban, while the export of processed ornamentals made from tortoiseshell was permitted. Even then it was prohibited to capture Hawksbill turtles less than two feet (61cm) in carapace length and other turtles less than two and half feet (76cm) carapace length. The Environment Investigation Agency (EIA) , a leading non-profit organization that works undercover to fight environmental crime in March 1995 found tortoiseshell products were openly available in shops in Colombo despite a complete ban on its sale in Sri Lanka. The EIA infiltrated the trade and their investigation revealed that four main dealers were exporting tortoiseshell to Sri Lanka from Maldives, often smuggled in consignments of dried fish, and tracked down the biggest supplier in the Maldives. The entire EIA investigation was filed with hidden camera. On 30 March 1995 as part of the “Animal Detectives” series British national television broadcasted the entire investigation. Under heavy pressure from environmentalists around the world and even threatening to boycott Maldives resorts, intervention of Parliamentarians from Europe and at a time when momentum was gathering for huge protest in front of the Travel Market in London by environmental groups. Bowing to this pressure, the Maldives Government had an Emergency Cabinet meeting on 21 June 1995 to protect marine turtles. When the first 10 years moratorium expired on 2004, it was extended for another 10 years in 2006, apart from prohibiting catching or killing of any marine turtle species, and their sale, import and export of its products for ten years, for the first time harvesting turtle eggs from 14 islands has been included. The Press Release by the Fisheries Ministry says that while the new 10-year moratorium was adopted after the earlier one expired in 2004, catching turtles and taking turtle eggs from specific islands were banned because it takes a long time for turtles to grow and because the measures taken before to protect sea turtles did not show satisfying results. However, Fisheries Ministry’s announcement said that when banned on catching or killing was imposed in 1995, turtles have started to become more visible in the waters of the Maldives. Turtle egg harvesting has been banned from the following islands, but not enforced in the Maldives. HA. Mulidhoo, HDH. Muiree, HDh. Vaikaramuraidhoo, R. Furaveri, R. Vandhoo, B. Maamaduvvari, B. Maaddoo, B. Olhugiri, B. Miriyandhoo, Th. Kanimeedhoo, Th. Fonaudoo, Th. Kandoodhoo, L. Gaadhoo, GDh. Gan. Under the 2006 ten years moratorium, 14 sanctuaries have been declared protected and its nesting beaches in the Maldives. Sadly there has been no proper management and enforcement of regulations. Some of the resorts do protect the nesting beaches, however most nesting beaches are not protected from human encroachment. 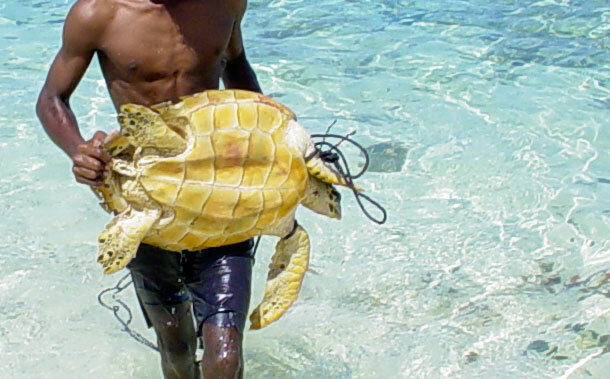 Eggs harvesting and even removing eggs from turtles stomach while it alive and illegal poaching of turtles have become most critical issue facing in the Maldives to save dwindling stock of marine turtles. The Maldives should declare a nationwide total ban on harvesting of turtle eggs, and properly protect and manage feeding grounds and other important habitats for effective conservation and management of these interesting endangered turtles. Almost all the uninhabited islands are leased to individuals or companies. The Government should include a new clause prohibiting the harvesting of turtle eggs from their nests and to protect the nesting beaches to the existing agreement on leasing of uninhabited islands. However, this would not solve the problem of poaching of eggs completely without strict enforcement. While enforcement of regulation is critical, refreshing public memory on the need to protect and preserve turtle population in Maldives has also become important. Responsible public agencies, such as Island Councils, civil society organisations and media should make an effort to raise awareness on and enforce the regulations on turtle protection. Anderson R. C and Waheed A (1990) Exploratory fishing for large pelagic species in the Maldives. Bay of Bengal Programme. BOBP/REP/46: 46pp. Didi N. T. H (1993) DhivehirajjeygaiUlheyVelaa.Ministry of Fisheries and Agriculture of Fisheries and Agriculture Malé Republic of Maldives. 74pp. Frazier J. G (1975) Marine turtles of the Western Indian Ocean.Oryx. XIII (2): 164-175. Frazier J. G., Salas S., Didi N. T. H (1984) Marine turtles in the Maldives Archipelago. Ministry of Fisheries and Agriculture of fisheries Malé Maldives. 53pp. Gardiner J. S (1906) The fauna and geography of the Maldive and Laccadive Archipelago. Cambridge University press.2 vols. Hackett H. E (1977) Marine algae known from the Maldive islands.Atoll Research Bulletin. 210: iii + 30. Laidlaw F. F (1903) In: Gardiner J. S The fauna and geography of the Maldives and Laccadive Archipelago 1: 119-122.